Adonis Cabaret has to be one of the raunchiest and funniest ways to celebrate a hen weekend in Bournemouth. You will be greeted with a cocktail and served a pre-show buffet dinner before being introduced to your glamorous Drag Queen comedy hostess who will have you in hysterics with her outrageous and wicked sense of humour. Once she's got everyone nicely warmed up it will be time for the main act to take to the stage, and boy are you in for a treat! Only the hunkiest, sexiest, cheekiest and best looking guys can line up for the Adonis Cabaret and you will go wild when they start to perform their "Full Monty" strip show. The show takes place in one of Bournemouth's biggest nightclubs, which makes it easy to carry on the hen party celebrations after the strippers have picked up their thongs and left the building. It's easy to see why the Adonis Cabaret is one of the UK's most popular hen party activities. It combines comedy with erotica and will deliver one of the funniest and most entertaining nights that you will be talking about for years to come! 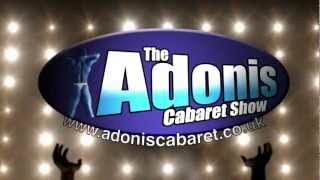 View our Adonis Cabaret £32 video and get an idea of what to expect on this activity.